This family is the wonder and admiration of all who take an interest in flowers. It attains its finest development in the tropics, where the common habit is to grow on the trunks and branches of trees, often far from the ground. It is also universal in temperate regions, but there the habit is generally to grow on the ground and produce flowers, which, though too small to attract attention from the gardener, are yet of singular beauty. 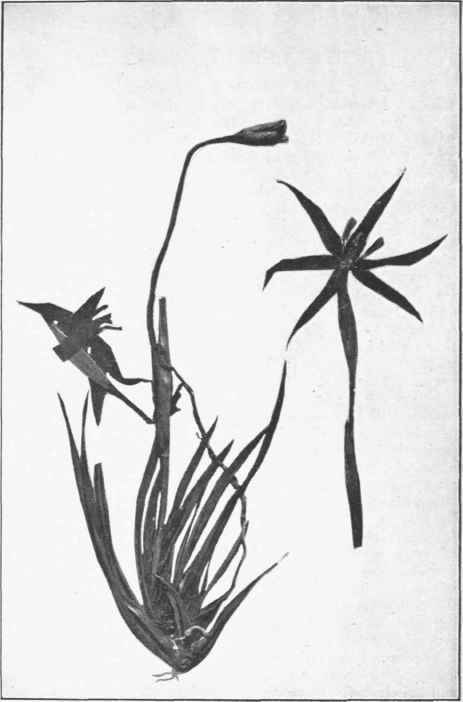 The flowers of Orchids have usually some singular shape that appeals at once to lovers of the curious. But not always so; occasionally they have the same regular form we are familiar with in other groups. The most noticeable feature by which they can be known is that the stamens and style are intimately blended to form a column in the centre or to one side of the flower. Amongst Monocotyls this condition we will only find in this family, but the same arrangement will be found amongst Dicotyls in our common Trigger Plant. 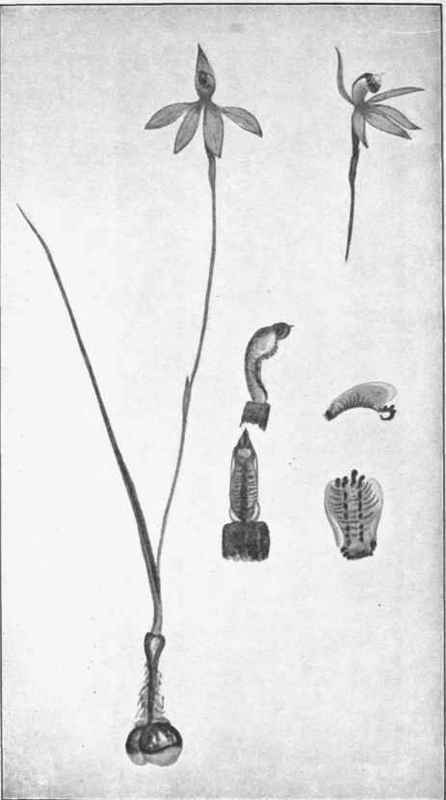 The ovary is placed below the flower; it consists of three carpels with a common ovarian chamber, with three lines of minute seeds placed in three lines on the walls. The perianth is normally formed of six parts, but these are often so much changed from simplicity that they are not always apparent. The peculiar structures produced in the perianth are modifications to ensure cross-fertilisation by insects. To assist this the pollen has an interesting feature: instead of being like free dust, it remains in an adherent mass, at one end of which there is a club with a sticky disc. When a fly or bee visits the flower the disc adheres to its back or head; it then flies away, carrying the pollen mass as a plume hanging over its head. Visiting another flower the pollen is rubbed on the stigma and a portion or all of it is left there. We have twenty-three genera and about eighty species, many of which are very common. We will describe some and briefly refer to others. One of our commonest genera is Pterostylis, meaning winged style, so named because towards the top of the column there are two delicate wings that converge towards their ends, forming a tube for an insect to travel up through. There are many species, called Green Hood, Helmet, Cow Horns, etc, all formed on one type. Cow Horns is very common in the spring. The flowers are solitary and nodding at the end of slender stalks. Green and brown and rather flattened laterally, it is made up of six segments of two series of three each, which it will be convenient to call calyx and corolla. It appears to be formed of two parts, an upper hood and a lower erect portion. The hood consists of one sepal and two petals, not united but adherent. The lower piece consists of two sepals which have slender terminations and rise up on each side of the hood. The third petal is a very peculiar structure, and as it is greatly altered from a petaloid form in Orchids, it is called the labellum. Labellum means lip. In Pterostylis it looks more like a tongue, which varies slightly in shape in different species. 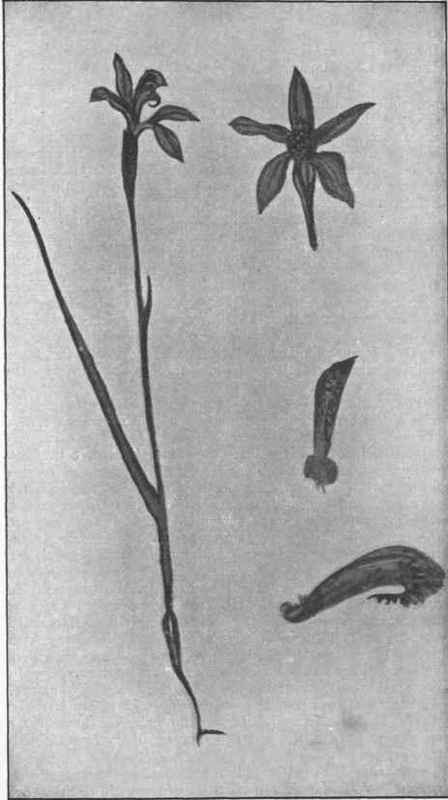 In Cow Horns the labellum is long, slender, dark, nearly erect, the acute tip protruding through the division between the two lower sepals. It is supported upon a flat curved stalk, and from its base arises a small curved lobe tipped with an irregular brush. The column is bent to accommodate itself to its position within the hood, and has on its anterior surface a fleshy stigma, and close above at the apex are two anthers containing pollen masses; along the upper third are the two delicate wings already alluded to. 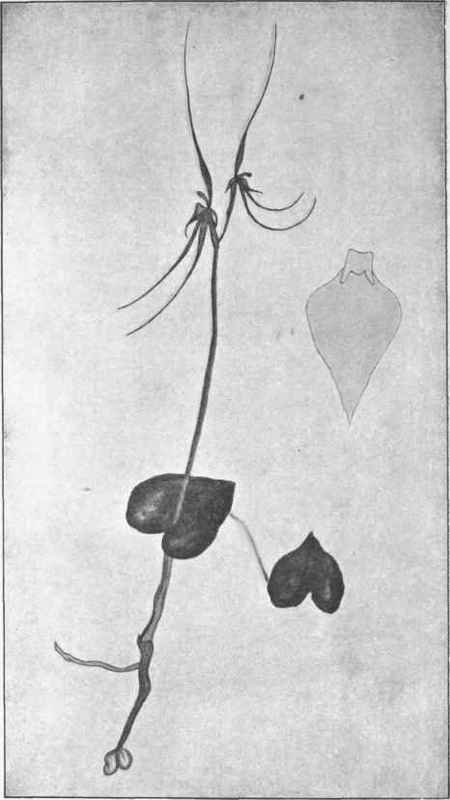 A fly attracted to this flower enters through the opening between the perianth segments, and alights upon the tip of the labellum, down which it walks towards the stigma. As soon as it touches the brush, by a peculiar faculty the labellum moves, placing itself close against the opening between the wings, where it remains for some time. The fly then proceeds to escape. The way it entered is shut off by the new position assumed by the irritable labellum; it therefore proceeds up the column between the wings, comes in contact with the anthers, the discs adhering to it, and flies away with pollen masses attached. Being a greedy animal, it enters another flower, and exits in a similar manner, only in passing the stigma it rubs the pollen on the sticky surface. As the fly always goes the easiest way, the pollen is never placed on the stigma of its own flower. We have many species of Pterostylis, but the flowers all conform to this type. Spider and Pink Orchid are dissimilar flowers of one genus, Caladenia The perianth segments in Spider are very long; in Pink Orchid they are short. The three sepals and two petals are free, and more or less spreading. 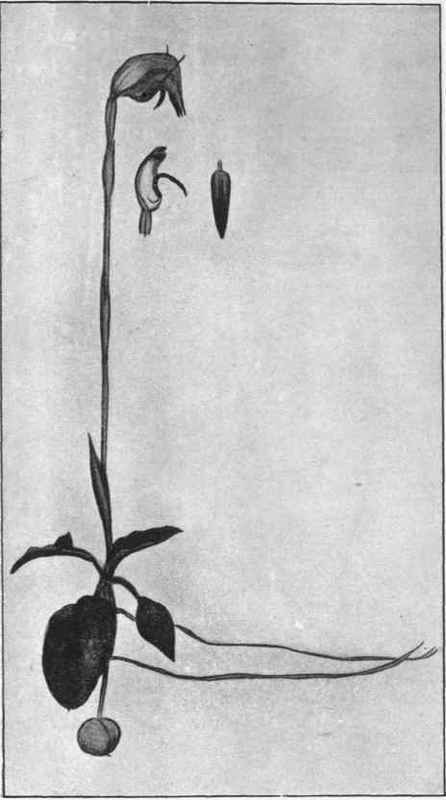 The labellum is broad and concave from side to side, convex in the long direction, where it tapers to a point; the surface and sides are variously clothed with papillae. 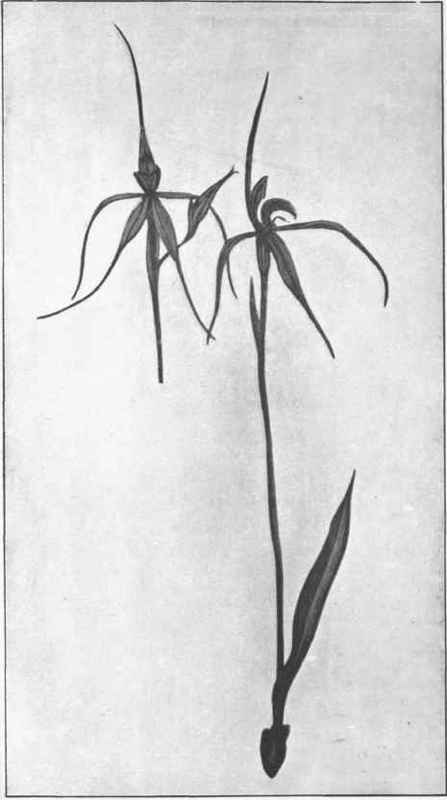 It is mounted on an irritable stalk, and the column is formed also very much as in Pterostylis.